ATSUGI, Japan -- For a glimpse at future styling trends from Nissan Motor Co., look to the headlamps on the Nissan Leaf electric car and the sculpted rear of the Infiniti M.
Front and rear lamps raised from the body surface and pronounced spoilers are two tricks Nissan will use more often to improve the aerodynamics and handling of vehicles -- in addition to giving them a futuristic flair, global design chief Shiro Nakamura says. "The important thing is the front end and the rear end," Nakamura said during an April 12 interview at the company's main design studio south of Tokyo. "Traditionally, the lamp surface has been flush with or a continuation of body surface. Now we are disconnecting that surface." Improving aerodynamics is a key strategy for Nissan as automakers race to improve fuel efficiency and meet stricter global emissions standards. Nakamura says he aims for a drag coefficient below 0.3 for all his designs. The Toyota Prius, by comparison, has drag of 0.25. 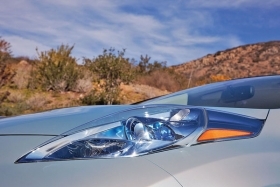 To improve aerodynamics and handling and present a more futuristic face, Nissan is raising the headlamps on new vehicles, such as the Leaf electric car, shown. The Leaf, which hits European and U.S. showrooms in December, best exhibits the new look. The front headlamps stick up like raised welts and follow the fender crease almost to the front roof pillars. Turn indicators on Nissan's upcoming Juke crossover get similar treatment. The style improves aerodynamics and reduces wind noise, but that's not all. "This gives us more design freedom," Nakamura said. Disconnecting lamps from the body contour, for example, allowed Nissan to lower the hood on the Leaf while keeping the lights high. At the same time, Nissan is paying more attention to the rear end, where rear lamps are evolving into spoilers to help control air flow, Nakamura said. The taillamps on the latest generation of the Infiniti M protrude slightly to create a squared end that helps reduce drag. The M also gets a pronounced ducktail spoiler that further improves handling and air flow. The next-generation Infiniti G will follow in the M's steps with a stronger, more defined grille, a sportier, slicker tail and lamps with more character, Nakamura said. Separately, Nakamura says the company is exploring new segments for Infiniti, which now relies on big sedans and large-sized crossovers and SUVs. "Probably we need a little bit more in the lineup for Infiniti, new models," Nakamura said. "We need some additional variation to get a larger customer base." He didn't give details but said going smaller was not the only option. When it comes to the Nissan brand's core lineup of sedans, Nakamura aims to give them more enhanced grilles and more upmarket surface treatment for a stronger brand image. The objective is to allow models such as the Altima to do better against the likes of the Honda Accord and Toyota Camry. For the first three months of the year, U.S. sales of the Altima rose 20 percent to 59,483 units, making it Nissan's best-selling model in the country. But the Accord racked up sales of 72,335 units, while Toyota moved 68,595 Camrys. "We don't want that to stay as it is," Nakamura said. "Sportiness and modernity" are key, he said. Watch for an evolution of the front end, Nakamura says. 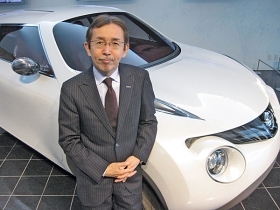 While Nissan's styling in the United States is unified, he says it needs to express a more unique Nissan identity. "I would like to put a more pronounced treatment of the front end," Nakamura said, "starting with the next-generation Altima, Sentra, those cars. We will renew the whole sedan lineup."